If you’re not immediately struck by the cleverness of the Sharper Image logo on James Street, check your pulse. 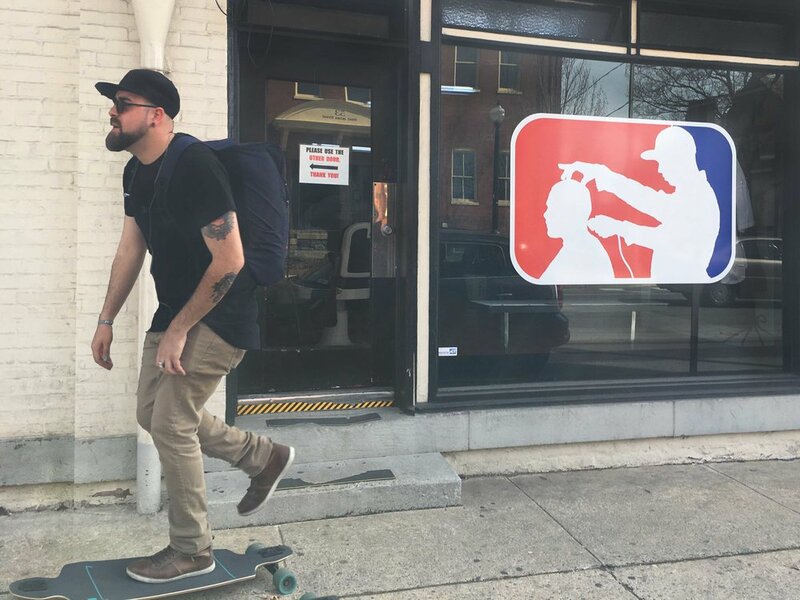 The silhouette of a barber and his client in the stylings of the famed NBA logo doesn’t just serve as a welcome to the basketball-themed barbershop it’s emblazoned upon, but often as one’s first clue that downtown Lancaster, PA has begun. Unsurprisingly, this eye-catching brand art is thanks to yet another talented city native’s artistic vision. In fact, any regular visitor to Lancaster City is familiar with the graphic art of Adam Serrano and probably Adam himself. Seen longboarding the streets with his signature beard and black-rimmed glasses, it’s difficult to imagine a more recognized character of the city. With a body of work like DFB Salon, That Shuu Girl Boutique, Attollo and Fruition Collective along with countless bands and other projects, the streets of Lancaster City are Adam’s portfolio. One could imagine the glamorous life this artist probably has with a job at some fancy graphics firm and a condo in the West End. But like many freelance creatives, financial stability is a constant struggle of looking for that next gig and the overwhelming urge to throw in the towel. Adam followed the next logical step and enrolled in the first design school he could afford. “After a few years it felt more like an Advertisement school than an art school. Pretty much everyone went on to work for the same company.” Feeling creatively unchallenged and discouraged by what seemed like a limited array of career options, Adam dropped out in hopes of forging his own path. And as expected, that came with some obvious challenges. But it isn’t just self-deprecation, it’s also the optimistic opportunist in Adam that drives him to provide his services for free or deeply discounted, “You meet so many people with so many great ideas and you see the potential in them. Even though they can’t afford you, you know that if they just had this one little piece of this puzzle, they could blow up and you’d be part of that”. Despite one’s opinion on Adam’s lifestyle, a quick look around Lancaster City will prove the impact he and his art have had on our community. And while the condo, the car and other traditional shows of success are on hold for Adam, the reputation he has carved for himself in Lancaster as one of the city’s most talented artists cannot be purchased.